The return of the legendary 392-cubic inch HEMI® powertrain back to the street in the Dodge Challenger SRT8 392 provides another step in showcasing the evolution of the performance brand. Pumping out 470 horsepower and 470 lb.-ft. of torque, the newest HEMI engine in the SRT product lineup provides an additional 90 lb.-ft. of torque at 2,900 rpm versus the previous 6.1-liter V-8 engine. The added torque allows for inspired standing starts and improved straight-line performance while new, performance-tuned motor mounts improve idle stability and ride control at any speed. An active intake manifold and high-lift camshaft with cam phasing provides maximum low-end torque while optimizing high-end power. 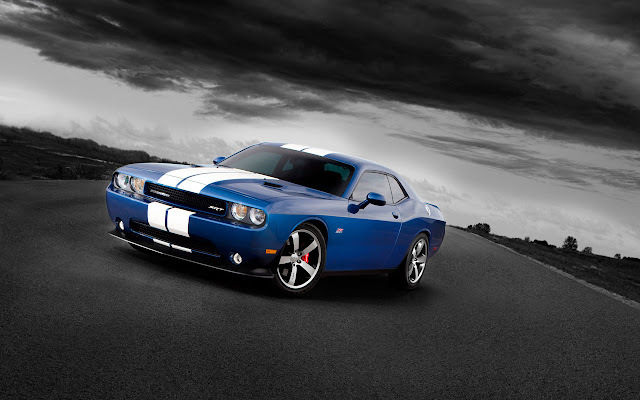 The 2011 Dodge Challenger SRT8 392 is available with either the standard five-speed automatic transmission with Auto Stick or an available Tremec TR-6060 six-speed manual transmission that was first offered on the 2008 Dodge Viper SRT10®. An improved heavy-duty clutch provides easier shift engagement. 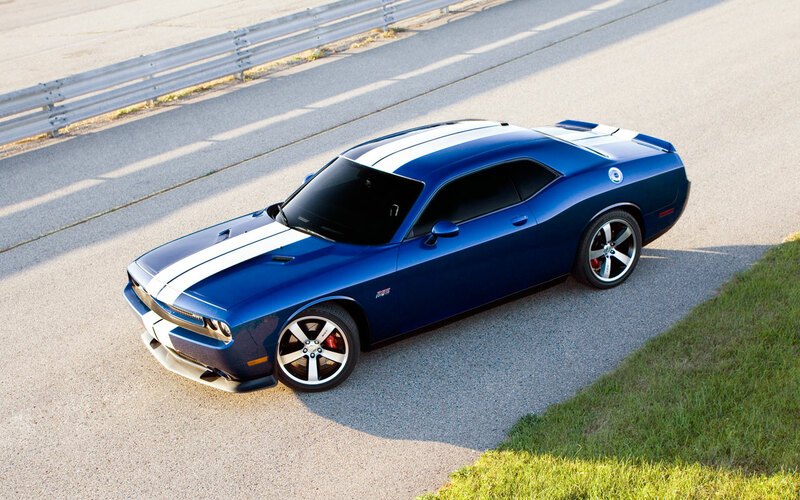 Like the original 392 HEMI, the performance on the street and at the track is sure to turn heads with numbers such as 0-60 mph in high 4-second range and quarter-mile elapsed time in the high 12s. New for 2011 is the Fuel Saver technology in automatic transmission equipped models, which allows the engine to operate economically on four cylinders or use all eight cylinders when needed. 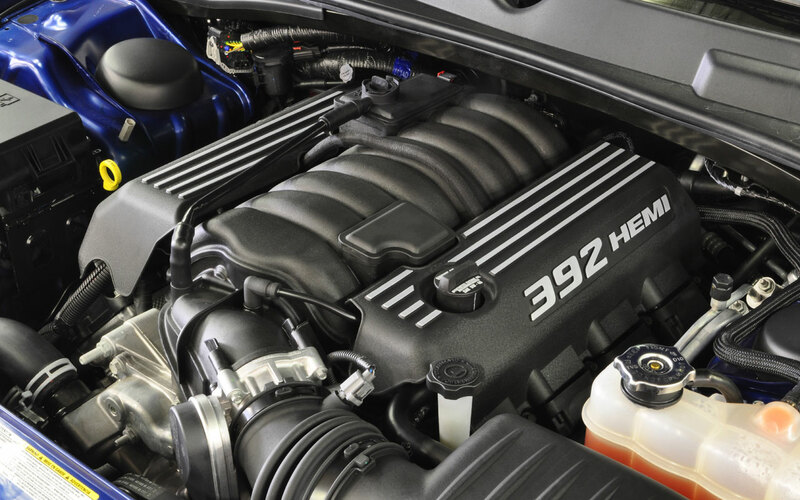 Under the hood, unique valve covers with painted silver ribs and the “392 HEMI” logo give the HEMI powerplant a clean, yet aggressive look. A redesigned SRT-tuned exhaust system results in a deeper, throatier note that will surely create envious onlookers both during daily commutes and at the race track. 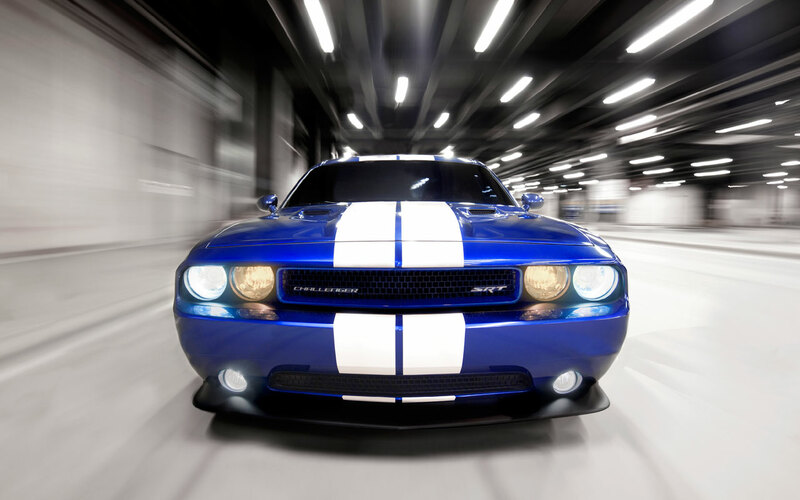 The result: the 2011 Challenger SRT8 392 is capable of .93g on the skid pad – the most of any production Challenger and on par with some of the world’s best-handling performance coupes. 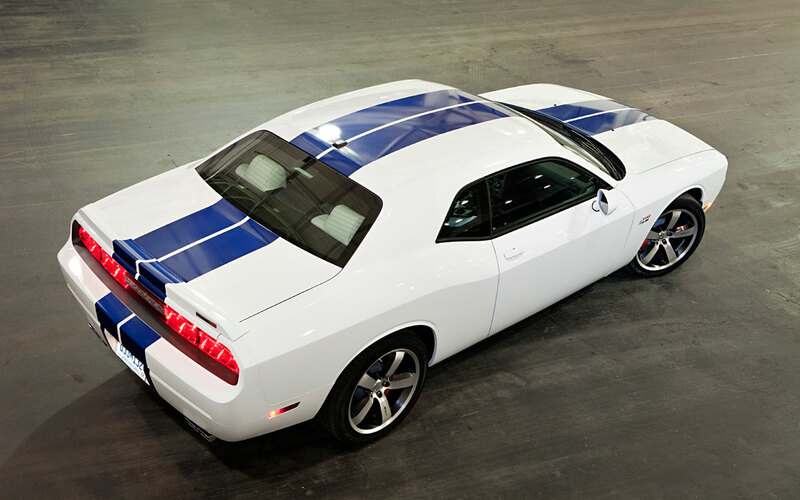 The exterior styling of the 2011 Dodge Challenger SRT8 392 remains unmistakably Dodge, with proportions that evoke a bold, instantly recognizable vehicle that has a wide, stable stance on the road. A larger front splitter and integrated front fender spats improve overall high-speed aerodynamics and overall balance. 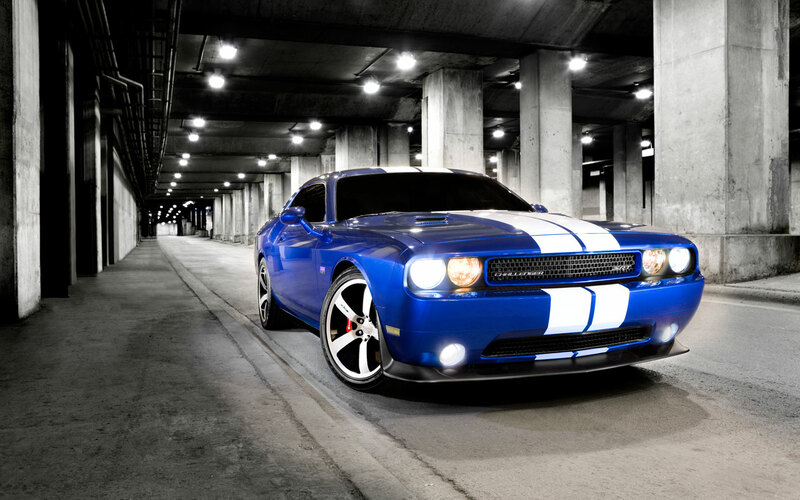 Top speed has been increased to more than 180 mph with the manual transmission (173 mph in the automatic). A newly modified front fascia chin spoiler improves aerodynamics and is accent painted for a more aggressive look. The rear deck-lid spoiler also is completed in matching body color. The precise performance handling of the Challenger SRT8 392 comes to life through a new, right-sized, three-spoke steering wheel that features a carbon fiber accented leather wrap and silver metallic painted spokes at the 3-, 6- and 9 o’clock positions. The trapezoidal instrument panel features a four-bomb gauge cluster with chromed accent rings and unique, new for 2011 SRT graphics. Inside the cluster, the SRT-exclusive Electronic Vehicle Information Center (EVIC) with performance pages provides the driver with trip information, multimedia information from the Media Center radio, along with instant feedback on 0-60 mph time, 60-0 mph braking, G-forces, one-eighth mile and quarter-mile times. Power lumbar-equipped front seats are standard on all Challenger SRT8 392 models. It’s also much easier to get in and out of the rear seat. The driver’s seat now features seatback tilt with memory and an easy to reach release handle, while the front-passenger seat adds tilt and slide with memory, which makes it even easier to use. New, highly damped shocks offer a firm ride that maintains the feel for everyday commuting while being fully capable for the more challenging situations. SRT engineers recalibrated the suspension geometry to improve Challenger’s balance, cornering ability and steering responsiveness. Quicker steering ratios and new negative camber settings all around dramatically improve Challenger’s appetite for high-speed cornering. The performance SRT-tuned, fully-hydraulic steering system also has been improved with a new, heavy-duty pump and revised gearing to give drivers more direct feel and on-center response.